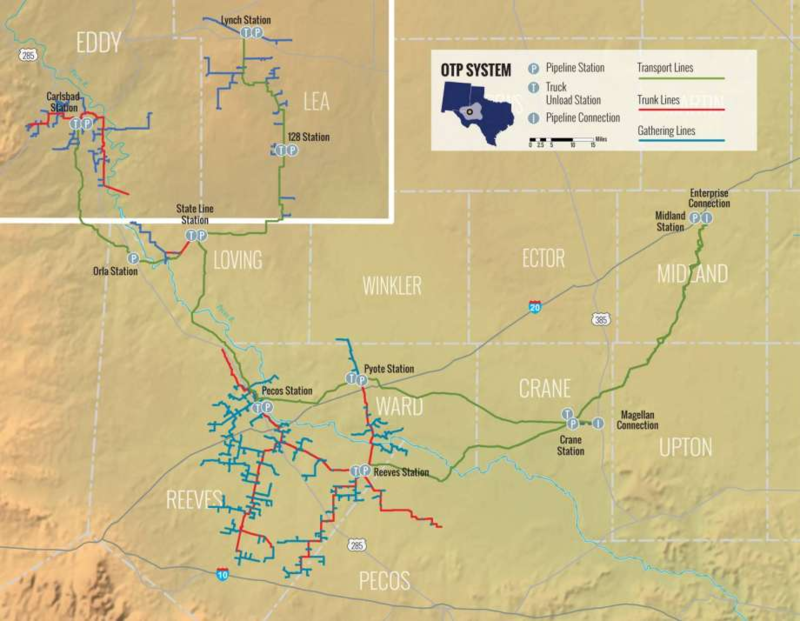 New York private equity firm Stonepeak Infrastructure Partners bought Permian Basin-focused pipeline operator Oryx Midstream in a $3.6 billion deal. The two companies announced the deal on Tuesday with Stonepeak buying all of Oryx's assets. With more than 1,200 miles of pipeline and 2.1 million barrels of storage, Oryx is touted as the largest privately-held crude oil pipeline and storage terminal operator in the Permian Basin of West Texas and New Mexico. "As we begin our next chapter and new partnership with Stonepeak, we look forward to the operational and capital support they will provide our team as we continue to aggressively grow our footprint in the Permian Basin," Oryx Midstream CEO Brett Wiggs said in a statement. Under the deal with Stonepeak, Oryx will be able to keep its name and headquarters in Midland. Oryx was in the middle of an expansion project at the time of the sale. Once complete, the company will be able to move 900,000 barrels of crude oil per day for its 20 customers. In a statement, Stonepeak partner and energy business head Jack Howell described Oryx as the most attractive Permian Basin midstream company that the private equity firm had evaluated. "Our critical focus will be on continuing to provide Oryx's diversified customer base with best in class service offerings to accommodate their growing production while also pursuing new commercial opportunities across the value-chain," Howell said. Oryx was launched and owned by affiliates of Quantum Energy Partners, Post Oak Energy Capital, Concho Resources, WPX Energy and other investors in 2013. Giant furnaces come to the spill and torch it sterile, haul it off. I've heard torching is normally only for small and/or remote on-site treatments. if there is a landfill nearby they just haul; at least according to my biologist friend who does cleanup plans. Pipelines of various types break all the time. Yes a majority of the breaks can be detected reasonably quickly - but not always - huge pipelines need to spill a LOT before sensors pick it up. I worked in environmental law enforcement for about 15 years. It may surprise some that the largest pipeline break files I worked on were not crude at all, the largest by volume was actually a water main in a city; the chlorine killed a bunch of fish in a nearby river. The petrochemical industry most often had lines break that contained brine (salt water). All true, Ron. Thus, if you have this really nice aquifer that is NOT polluted, are you not better off to keep it that way? Hey, ya gotta drink the stuff! I am as concerned with pollution as anyone and you can be sure that the farming activities over the Ogallala aquifer have created plenty of pollution. There are also other pollutants, of many kinds, that have found their way into the Ogallala aquifer. The recent severe flooding has recharged the aquifer and destroyed many farming operations, buildings, sewage treatment plants etc. Farms and ranches are the prime rural polluters. The cost benefit ratio favors transporting our oil and not tying up progress in the leftist courts. Ogallala flooding images https://images.search.yahoo.com/search/images;_ylt=AwrE1xq.kaZcG_wAg55XNyoA;_ylu=X3oDMTEyODVlOWZxBGNvbG8DYmYxBHBvcwMyBHZ0aWQDQjI5NDRfMQRzZWMDc2M-?p=ogallala+flooding&fr=mcafee This flooding has caused plenty of pollution. This aquifer is probably no cleaner than ours in Illinois. Similar farming and ranching goes on. Used to do pretty major spills, few thousand gallons, whether diesel, gas or crude. And your right, EPA qualified landfills will get big spills too. And yes, pipelines break all the time. Friend of mines pond 10 yrs ago got filled with red diesel, 1 acre pond 4 feet deep of diesel. Estimated 270k gallons what they said.. Yellow clay absorbed into the dike and started down the other side. Buckeye pipeline. No longer in biz. Said something similar on the 1st page, and yes Ron, here just north of Peoria is the San Koty, a giant underground lake. The farming from interstate 80 central in straight down is on giant cornfield. Ammonia in the fall injected when they chisel plow, and spray by plane now seems to be the new thing. And we wonder why cancer is running rampant....Beans get their own special brew of chemicals. When Trump announced last fall more ethanol, the farmers were jumpin' fer joy. The Illinois river is still polluted but nor 1/10 as was in the 80's. Sure lots of them jumpin' Asian Carps tho. I guess the way to get things cleaned up is get public attention. ps. I am not anti-pipeline, or anti oil. But it doesn't hurt to be thougthfull. Pipelines remain the safest and most efficient way to transport crude oil across land masses. .....from here to the other end of the rainbow where you must live in a tent with your bicycle. That was rather negative, indeed acerbic, from you. Do you not feel a tinge ashamed of yourself for stooping to belittling comments? From memory, the stack of bags of fertilizer used every Spring was around 8 feet tall x 18 feet wide × 12 feet deep (stacked on top of straw bales in a shed to keep the bags of fertilizer dry). I was trying to show the hypocrisy of being anti pipeline while also driving cars and heating or cooling your home. The solution to global warming is on the demand end of the equation. Blaming pipelines that are simply moving the oil from A to B using electric pumps and not emitting any CO2 is rather off base. Plus oil sands oil spilled on the ground is basically asphalt. It is no more toxic than the roads we all drive on. If you thought I was being insulting -I apologize-was not my intention. To think a pipeline break could damage the Ogallala Aqufier is a totally made up piece of fiction. There was a Pipeline break in South Dakota where 9,700 bbls leaked out. The pipeline was shut down immediately followings the spill. The spill was cleaned up and the pipeline was started up two weeks later. The spill did not make it below the top soil. The contaminated top soil was removed and replaced with clean top soil. It is estimated the Ogallala Aquifer contains a 500 billion bbls of water. As it was mentioned the aquifer literally reachs surface in the form of lakes. The amount of nitrate runoff should be the issue, not oil contamination. Ignorance is running rampant. Thank you Tom for your discussion of nitrate fertizer. Perhaps the environmentalists should work on shutting down all agriculture in Nebraska. By the way, isn’t much of that corn used in auto fuel? Setting aside the politics of oil pipelines for one moment, and instead donning our "reasonableness pants", one must acknowledge the propensity for oil pipelines to spill oil and that spilling oil (particularly in bodies of water) is bad. No need to get too technical there. Likewise, one must also acknowledge that world uses fossil fuels today, and that we just can't go around abolishing all oil pipelines because they're "evil". If the world needs oil but our system for transporting that oil has flaws, we must look for better ways to move that oil. I don't necessarily mean new systems because that is not a practical instant fix. Big Oil can no longer stick its head in the sand and toe the party line and try to convince the world that spilling oil is not a big deal, or that it happens so infrequently that it's okay. That's silly and is a losing effort. People know better, but many will join in singing oil's (or oil pipeline's) praises because that's the side of the fence they are on. And likewise, environmental activists chaining themselves to oil pipelines and interfering with pipeline operations is silly, dangerous, and disingenuous, and the world has little tolerance for such shenanigans. People see your hypocrisy, and there simply is no better alternative TODAY than oil pipelines. On both sides we have stubborn folk digging heels in trying to convince themselves that they are right. Meanwhile, the issue just gets more and more polarizing. Pretty soon, the other side is simply not interested in hearing it anymore. Could we not instead acknowledge that the industry could do better in shoring up their problems? The oil industry has done a piss poor job in the area of public perception. There may be no turning back now, because heels seem to be stuck. Would have done them a wholelotta good if they had acknowledged their flaws quite some time ago and did something about it instead of insisting that there were no problems or that the risks were acceptable. And using this topic as a political baseball bat to woo followers is simply unethical. I'm not a big proponent of more regulation, but I do believe that companies who spew oil should be dinged--and severely. There is no other incentive that will do a better job of shaping behavior. Rodi, great post, gets right to the heart of the discussion. Here is one problem: "Seriously Big Oil" can take any ding and it does not seem to change much. When BP's well blew up in the Gulf, the CEO showed up in D.C. and handed over $25 Billion as a down-payment on their remediation. That $25 Billion did not even make a dent in their stock price. Nor their income statement. The place is so huge that it can take that kind of penalty and just shrug it off. Did that pile of cash take the sting out of the losses of the shrimpers? Sure it did. But that vast amount of spilled oil is still there, polluting the seabed, and while in warm water, I am not optimistic that it will degrade in my lifetime. The BP CEO freely admitted that nobody was fired for their gross incompetence and breathtaking stupidity. Even a dummy like me can figure out that if your drilling mud is coughing up bits and pieces of that blowout preventer valve down there, then everything stops until you figure out a way to seal off that bore and fix the problem. The moron on deck on that drill platform insisted on removing the drill. You saw what happened. On a strictly personal note, I don't have much of a beef with oil pipelines. I will say that the choice of route should be carefully selected to minimize the damage when the pipe breaks. And, as you point out, breaks are inevitable with the current state of technology. "When in doubt, go around." Great news! Let's go, get it built now! President Trump has approved more pipelines than incompetent Canadian PM Justin Trudeau. 1. 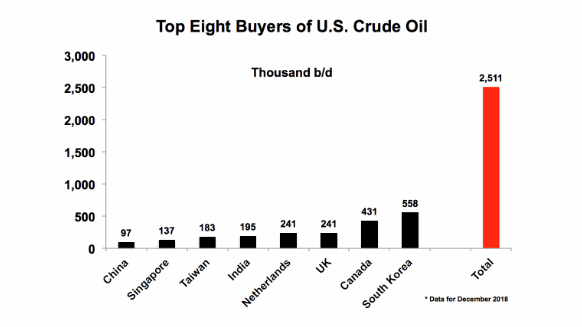 The Key buyers of US crude oil are CANADA and S.Korea....... From the map posted by Tom the project actually tries to bring oil from Canada to US and then export from US coastal port to other less volumous buyers or may be triple the export to South Korea?? ....... eerrr...... Owing to the transportation costs and operating costs.......... would South Korea not consider nearer and cheaper oil producing countries but only US crude oil which might be high in sulphur?? 2. Dear Bob.......... I'm not sure if the following news is correct but it probably says "the incompetent" that you mentioned (and his team?) has basically purchased the oil field and the whole infrastructure located in CANADA or no?? Yes, I am fully aware of the sequence of events at Lac Megantic; I actually prepared a Presentation for a Rail Symposium titled "What went wrong at Lac Megantic?" I also know the owner of that RR, another Yalie incidentally. His two RRs ended up bankrupt as a result. I attempted to buy that RR out of the bankruptcy court but ran out of money; the guys that did buy it were hedge funders with unlimited cash. Now that train wreck was the direct result of personnel decisions, in that case the decision of one driver to leave that train unattended and not set the hand brakes. It breaks so many Rules that it is just astonishing. Moving on to the oil, what was being transported was Bakken light crude to the refinery in St. John, New Brunswick, owned by Irving Oil Co. What is not recognized is that that crude contained entrained gaseous materials, in bubble form, which were not purged out at the loading area. As the train rumbled East, the gaseous materials came out of solution and formed a pressure bubble at the top of the cars, basically turning the tank-cars into rolling time bombs. You cannot seriously maintain that the "peanut butter" material, as you describe it, has the flammability of that Bakken Light. As you point out, WCS is totally thick, and presumably is not going to ignite, much less migrate. So placing WCS into a railcar is a bit like loading asphalt; it is not going anywhere, even if that railcar splits open. When tarry materials are trained, then you need no energy to pump it, and a lot less diluent to load it. As a practical matter that train might as well be hauling stone blocks. The energy required is only to overcome the inertia of the train and the friction of a steel wheel on a steel rail, which is quite low. Your rail "pipeline" can move material along in a rolling "pipe" some eight feet in diameter and a mile long, at 50 miles per hour, using 3,500 HP. And it can go to wherever the refinery is, simply by switching the tracks. Hard to beat. Then I hear these arguments about pipe being inherently cheaper than rail. It is not. Pipe takes a tremendous capital cost, while the rail trackage is already there, and if you need more, all you do is lay down the gravel ballast, and you drop in place the ties and rails. It is cheap and fast to build, and you can take the materials up and use them elsewhere when the oilfield peters out. It is "expensive" only because railroads are inherent monopolies without regulation in the USA, so the RR owners can charge what the traffic will bear. That has no real relation to actual costs. You might want to keep that in mind. I have a track about 200 yards from my house that is being totally rebuilt. I assume it is partially for shipping the oil and related liquids that travel through Decatur, Illinois. It is truly amazing to see how railroad track is built today. I have seen them work all the way down past Taylorville. I will have to look for a video to understand all of it. All good points Jan but one problem is that "seriously big oil" doesn't own pipelines. The midstream business is controlled by a bunch of middling players other than Enbridge, which at least has relatively deep pockets. One midstream company was recently purchased for only $3.5 billion and that puts the (eventually) $60billion that BP spent in sharp contrast. I'm all in favor of intelligent routes too and perhaps wrongly assume that Enbridge et al think the same. I'm not necessarily in favor of long go rounds to avoid water, since statistically we should figure that every mile of pipe is that much more likely to spring a leak. And you already know I'm all in on double walled pipelines at least. And I hate the fact that "greenies" are stopping 65 year old active pipelines from being refurbished and replaced. If they TRULY cared about the environment they'd be DEMANDING that they all get refurbished at a minimum! There are more than 2.4 MILLION miles of pipeline in this country. That dwarfs by orders of magnitude railroad lines. Enbridge could use some more serious deterrents, if you ask me. and I think I'm losing track of which of y'all are pinkos. Maybe we can look into getting some virtual badges to assign to ourselves. @CMOP? and I think I'm losing track of which of y'all are pinkos. For new readers, Rodi assigns pinko labels to anyone outside of central Michigan! All good points Jan but one problem is that "seriously big oil" doesn't own pipelines. The question arises as to who owns the oil flowing through the pipe.It is not an insignificant question. The tanker industry is loaded with these Greek operators of marginally seaworthy ships and dubious officers, and when that ships wrecks, the paper trail as to who and where the owners are simply disappears. So the injured parties, including sovereign States, hold the owners of the oil cargo responsible. As you might imagine, the bigger players no longer charter these old tubs and hire serious ships from serious companies. Now if you transpose that legal modem onto pipelines, the question arises: can the owner of the oil be held liable for the spills, where the carrier is paid to transport the stuff? Answer: probably. If I were the owner/shipper, I would certainly be buying insurance. Cheers. Yes! This news put a big grin on my face this morning. Oil & Gas is neither dead nor dying, and the Oil & Gas industry is not going away any time soon. The global economy runs on hydrocarbons. Ignoring that fact (like AOC) and jumping up and down and holding your breath until you pass out like a 3 year old throwing a temper tantrum simply DOES NOT CHANGE THE FACT that the global economy runs on hydrocarbons. And will continue to do so for decades, for the forseeable future. Simple question for the EV fanatics ... what are the main energy sources for generating electricity globally? Better question, what technologies make those non-hydrocarbon sources efficient enough to be viable? I don't see a lot of wind turbines made out of wood and sinew.